It's all Samsung at the moment, and we're not surprised because we are expecting some big news to comeÂ out of IFA this week. Their latest announcement is to do with LTE versions of the Galaxy SII and the Galaxy Tab 8.9. Both feature a 1.5Ghz dual core CPU, with the SII also having a large 4.5" screen. 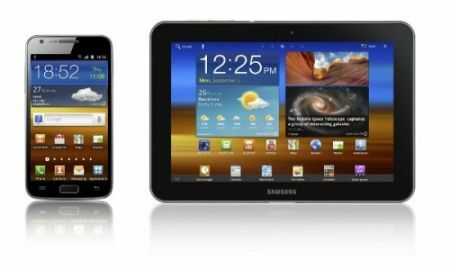 Samsung speeds up the Smarter Life with LTE versions of the GALAXY S II and GALAXY Tab 8.9 SEOULâ€“(Korea Newswire) August 28, 2011 â€” Samsung Electronics Co. Ltd., a leading mobile phone provider, today announced LTE editions of its GALAXY S II and GALAXY Tab 8.9. These stylish devices now offer high-speed 4G connectivity in addition to power, portability and second-to-none screen technology. â€œWith the introduction of GALAXY S II LTE and GALAXY Tab 8.9 LTE, we will take the capabilities of these devices to a whole new level. LTE redefines the user experience made possible by these devices and opens entirely new possibilities in terms of content viewing, sharing, quality and connectivity,â€ said JK Shin, President and Head of Samsungâ€™s Mobile Communications Business. â€œThis is a milestone in our commitment to lead the charge in 4G mobile telephony around the world, both in terms of back-end network solutions for service providers and the development of powerful consumer handsets,â€ added Shin. When connected to a 4G network, LTE technology allows portable devices to download high-quality files at speeds of up to 100Mbps, and to upload at speeds of 50Mbps theoretically - five times faster than even the quickest HSPA+ connection. This means that a four-minute long MP3 track can be downloaded in 0.3 seconds, or an entire film file in less than two minutes. The enhanced connectivity afforded by LTE technology opens up a range of possibilities for users: Features like social gaming, video conferencing and high-quality media streaming can all be enjoyed seamlessly, with vast improvements in download times and connectivity. 4G technology also enables the seamless and near-instant sharing of multimedia content with friends and family, ensuring that users can share the experiences they love whenever they want. The addition of LTE to the Samsung GALAXY portfolio also opens further opportunities for mobile application and content developers creating a new generation of mobile services that take full advantage of increased bandwidth and improved connectivity. GALAXY S II LTE In addition to offering a high standard of connectivity, the GALAXY S II LTE delivers powerful performance due to its 1.5GHz dual core processor. Superior 3D graphic performance makes games and video consumption fast and smooth, while popular Web pages like Google, Yahoo and YouTube can load easily, giving customers instant access to the information they need. A 4.5â€³ Super AMOLED Plus display provides stunning visual clarity, with HD video and images taken on the deviceâ€™s 8MP camera displayed in full vivid color. The GALAXY S II LTE also offers a rich content experience, with Social, Game and Music hubs all included, while the Readers Hub will be available for download after launch. These are in addition to a number of enterprise solutions aimed at increasing productivity. Running on Android 2.3, the GALAXY S II LTE is easy and intuitive to use. Additionally, the GALAXY S II LTE can also be connected to up to eight devices via WiFi, meaning that files can be quickly and seamlessly synchronized with laptops, tablets and other Smartphones. GALAXY Tab 8.9 LTE The LTE edition of the GALAXY Tab 8.9 is incredibly portable, measuring just 8.6mm thin while weighing only 455g. The boosted connectivity and genuine portability ensures that the GALAXY Tab 8.9 LTE is the ideal device for modern professionals, who need to stay productive and entertained while on the move. LTE capabilities enable video conferences to be held without need to worry about failing connections, while the 8.9â€³ screen enables easy rendering of business content such as presentations. The TouchWiz interface enables an intuitive user experience, enhanced by the space and freedom provided by the large display. Whether writing emails on a trip or reading an eBook in bed, the GALAXY Tab 8.9 LTE provides the ultimate tablet experience without compromising mobility.